With seamless habitation from the Neolithic to the Medieval times, Fea or Fea in the present-day St. Andrew bay, in the Katakolo area, was an important port in the antiquity, the port of Pisatida and its boundary with the northern area of ​​Koilis Ilida. When Ilida subjected Pisa and the other cities as residents, Fea served as the second most important post-Kyllini port of the elite state. F(e)ia during the Homeric era was a city tilted. Below its walls, according to Homer, the conflict between Pylia under Nestor and the Arcadians took place. In Odyssey, Telemachus meets Phoeus on his return journey to Ithaca, having left behind Pylos where he met Nestor seeking information about his father. It seems that Fea was an important identifying element for navigation in the Ionian Sea and trips to the Greek cities of Lower Italy. In the years of the Peloponnesian War, the harbor and the city of Phoeas also constituted the scene of conflicts between the opposing factions, and at the end of it, it experienced the same fate as Killini, losing its walls as a humiliating term imposed by the victors of the war Lacedaemonians to the defeated Eleans. The distance between Fea and Olympia is determined by Strabo geographer in 120 stages. However, the traveler Pausanias does not refer to Pheasia, except by describing a war scene in the Kysselos Larnaka which he saw in the sanctuary of Olympia on the conflict of Pilias; Arcadians. Perhaps Fe(i)a's silence in Pausanias' work shows that in his years the city and the port had declined. The population of Feas was extensive and sparsely populated, as evidenced by the surviving archaeological remains. 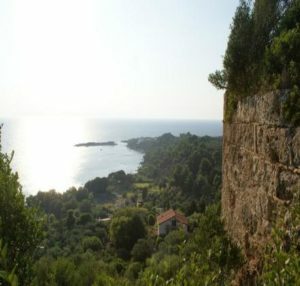 In classical times, the village occupied the entire surface of the cape, now called Pisces, approaching to the north the present settlement of Skafidia, in the place where the small river with the ancient name Iardanos is poured into the Ionian Sea. At the top of the hill, above the harbor, was the acropolis of Fea. The view of the surrounding area from this point is excellent, since there is unobstructed visibility to every point on the horizon, towards the Ionian, the western Peloponnese up to the mountains of Arcadia. Throughout the antiquity, the port of Feas served as an important gate especially during the summer months through which people and goods were flowing naturally to and from the Hellenic state. However, this picture changed every four years, in the summer of the Olympic Year, as the era of the Games was approaching. The harbor and the people of Fea, as well as the Killini northern, welcomed the crowds of Greeks who came to the sacred land of Ilia by ships of that time, with the origins of mainland Greece and the numerous colonies across the Mediterranean in order to take part in the majestic A religious feast in honor of Zeus in the enclosed sanctuary of Olympia. In any case, hundreds at the beginning and later thousands of pilgrims brought with them the precious, small or greater tributes to the Sanctuary, and along with them various other goods, animals, commodities and items for consumption. The magnitude of the passenger and commercial volumes that were trafficked by sea routes increased progressively, following the evolution and progress of shipbuilding and shipping and the correspondingly magnificent reputation and glamor of the Olympic Games. As long as they lasted, ships of all sizes and types remained anchored in the natural bay of Fies and the port of Killini, waiting to carry all the passengers back to their homeland and with them various agricultural and craft products of Ile(i)a people. Certainly, the most valuable "cargo" of some ships was the most important and most important passenger of his Olympic champion, whether it was Milona from Croton, Diagoras from Rhodes, Thaagen from Thassos and so many others. In the Chronicle of Morea, the castle is known because in some of its rooms the important marriage of Godephrios II Villehardouinou, the heir to the Princess of Achaia and Aghia Kourtenai, the daughter of the Latin emperor in Constantinople, Petros Kourtenai, was agreed upon when he was accommodated here Her mother, as they passed through the sea to the king. In "Geography Old and New", the metropolitan of Athens Meletios hand over to us the castle of Katakolos the name "Kaloskopion", the Greek version of his Italian name ("Belvedere"). The designer, R. Traquair, suspects the destruction of the Pontiacaster in 1470 by Constantine Palaiologos, as he acted in the castle of Glaredzas as the last before their Turkish occupant, so that, as the latter did in the Peloponnese, they would not benefit from their conquest. The narrowly preserved ruins of the medieval fortress stand out in the north-west corner of the tower, which is maintained at a height of 12 and a width of 8 meters. Also, at the center of the flat surface of the formerly cast castle, the ruins of a 2m long, dome-shaped reservoir are preserved. Today, the coast and the bottom of the bay of Ag. Andreou, shows huge gaps showing the significant geological changes and transformations that have occurred over the centuries from the intense seismic activity in the area. In particular, the earthquake of the 6th AD Century which shook the entire northwestern Peloponnese and precipitated the magnificent temple of Zeus of Olympia is probably the culprit for the sinking of Fe(i)a and its port facilities. In the late 1950s archaeologist Nick. 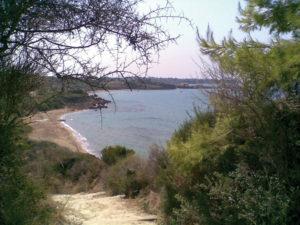 Gyalouris carried out underwater and coastal research in the Gulf of Phoeas, which yielded rich and varied archaeological finds. According to her, the building remains are located throughout the bay, up to 200m. From the shore and at a depth of up to 5m. Among the ancient ancient remains found, many architectural members such as columns, Dorian and Ionic columns, as well as capitals, some of which were recruited and recovered. -You may still find some of those not deep at all inside the sea. The timelessness of this location is proven by the discovery of vases of all time, from the Mycenaean to the late Roman era, both in the sea and on the shore. The two Cycladic figurines dating back to the end of the 3rd millennium, which, according to N. Yalouris, point to the use of the harbor since this time, as well as the relations between the western Peloponnese and the Aegean and the Cycladic civilization . In the islet "Tigani" The investigations yielded findings from Classical to Roman times.However, because of the lack of a large part of the image presented by Fea, both in antiquity and in medieval times, it is necessary to carry out systematic research on this important land, land and sea. As was the case in antiquity, even today, once the Sanctuary of Zeus receives thousands of visitors every year from every corner of the planet. The bulk of the visitors arrives at Olympia, following the same road that the visitors of the sea had chosen in antiquity. Fioda's contemporaneous port of Catalun, after stoppage of centuries, once again welcomes the not so many thousands of travelers who take part in the weekly, usually long-lasting cruises. 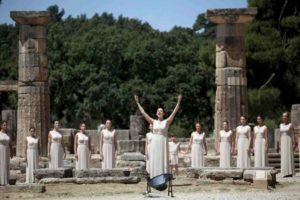 Without knowing it, foreign visitors will follow the luxury coaches the footsteps of the ancient route from Fea to Olympia and for only a few hours they will be hosted in the once sacred territory of the Hellenic state. At the same port they will return and depart for their next destinations, most enjoying the nature and beauty of the Olympic Landscape, but most of all reborn by the Olympic Ideal, as well as the people of the ancient era. - Xydis Th., "Iliaka", pp. 166 - 191.